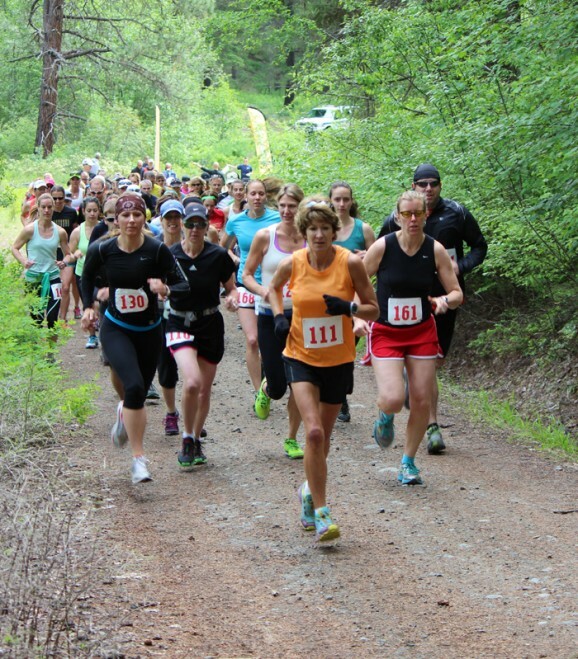 Red Devil 25K runners congregate near the start line during Saturday's event. 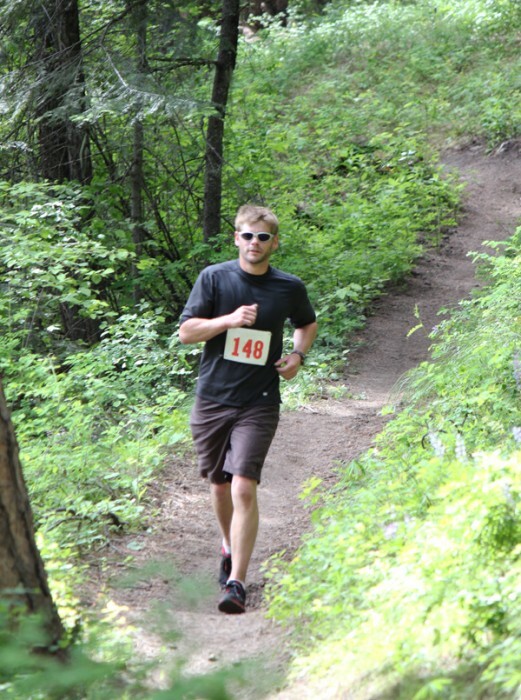 CASHMERE — Chad McBride had plenty to deal with Saturday in the Red Devil Challenge 25K Trail Run. He maneuvered through some muddy patches, went up hill to the tune of about 3,800 feet, and crossed two streams not once but twice. But it wasn’t what lay before him in the Wenatchee National Forest that caused the most concern. It was what was behind him. 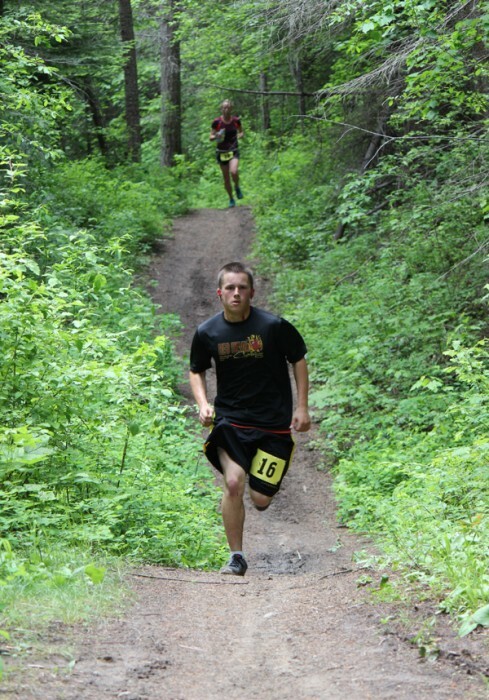 McBride edged Hodges by a mere 15 seconds to capture the men’s 25K title in 2 hours, 9 minutes and 5 seconds. Claiming third was Peter Graf in 2:13:29. As for Hodges, he could see McBride — occasionally. “He was like a mirage,” Hodges said. 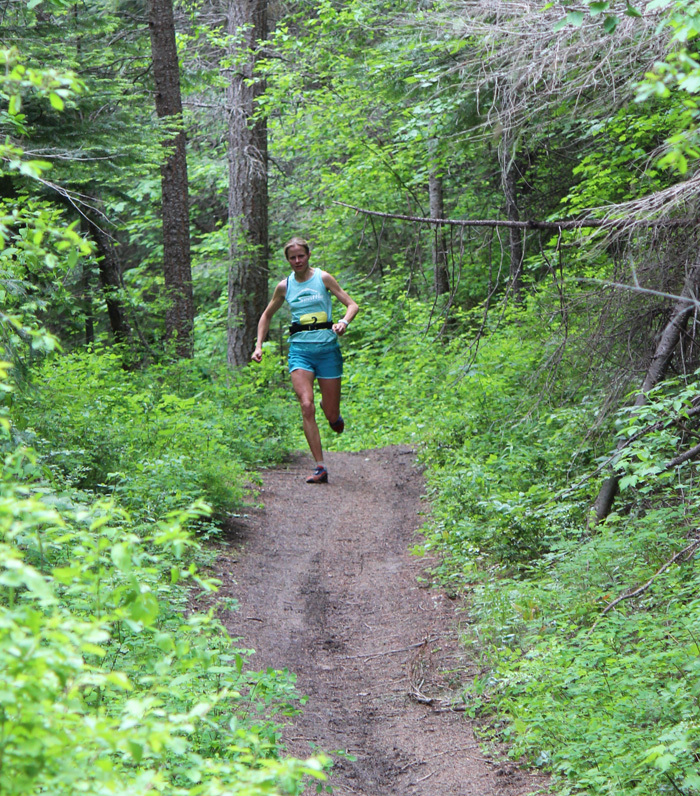 25K women's winner Marlene Farrell emerges from the Devil's Gulch with about a mile left in the race. Leavenworth distance runner Marlene Farrell cruised to her third-straight women’s 25K title, finishing in 2:11:41 and in third overall (men and women). Farrell said she almost slipped once or twice on the muddy trail between Devil’s Gulch Trailhead and the finish at the Sandcreek Trailhead but was otherwise undeterred. Runner-up was Leavenworth’s Kelsey Ferguson in 2:28:07. Coming in a for third place were Kathleen Harri and Erin Delude of Bellingham in 2:31.50. In the men’s 10K, Justin Pulliam won the race in 54:06, followed by Travis Redfield in 55:39 and Scott Young in 1:03:49. Leavenworth’s Elizabeth Ryen captured the women’s 10K with a time of 56:20. Julie Christensen of Wenatchee came in second in 58:25, holding off Marisol Galeana of East Wenatchee by a mere second (58:26). 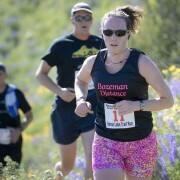 McBride and Farrell also were the first man and woman respectively to reach the course’s first support station, near the highest point at the 5-mile mark. For that, they were crowned “king and queen of the hill” and received Garlini’s gift certificates compliments of CrosSport Performance. The youngest finisher in the 25K was Jerrad Collins of Cashmere. For his efforts, he received a free pair of shoes from Salomon. 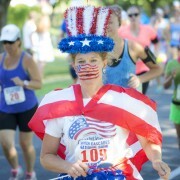 “It was harder than I thought it would be, but I want to run a marathon in two months,” Collins said. About 150 runners signed up for the third-annual Red Devil Challenge, presented by Volyn Law, more than doubling last year’s turnout. Temperatures were in the mid-50s at the start, slowly warming into the high 60s under mostly sunny skies. Except for the muddy spots brought on by rainy weather in May, the course was in good shape. “I thought it made it more fun,” Wenatchee 25Ker Steve Tidd said of the mud. “It’s such a fantastic course — some big climbs but it’s all really runable,” McBride said. 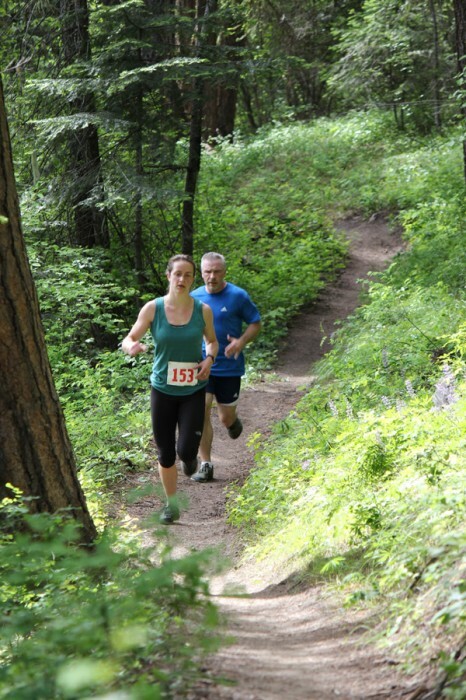 The 10K course was originally designed to begin at the Devil’s Gulch trailhead and conclude at Sandcreek. But last fall’s wildfires scorched hillsides farther up Mission Creek and the U.S. Forest Service closed road access to Devil’s Gulch over fear of flash flooding should rain fall. Galeana, the third-place finisher in the women’s 10K, said she was impressed with the course. 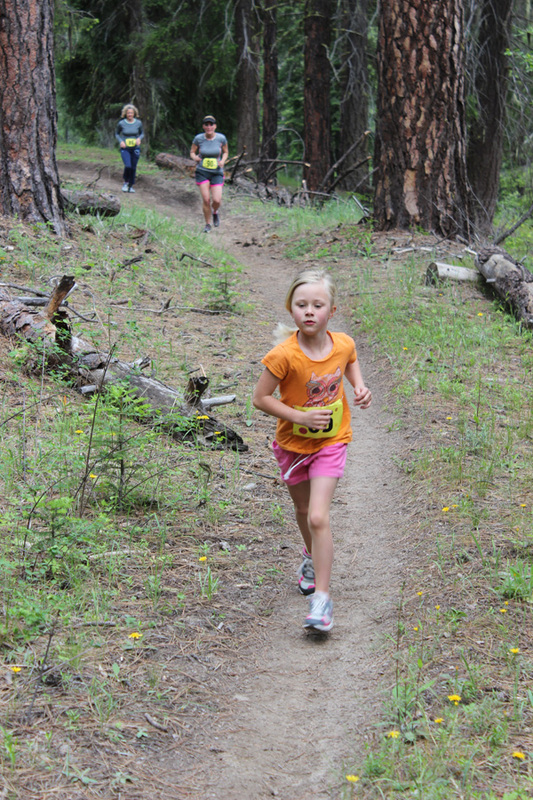 Kids (and adults) participated in the 1.7-mile "Mini-Devil" on Saturday, too. 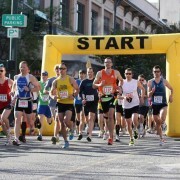 At 16, Jerrad Collins of Cashmere was the youngest 25K finisher. Runners head up a short incline soon after the start of the 10K.